One of the big selling points of many chiropractic clinic seminars on “stem cell” therapy is that the therapy will regrow cartilage in severe knee arthritis. This is interesting, as the clinics are actually using dead stem cells, and no expert in this area I have spoken to has ever seen this occur in any real stem cell therapy. Hence, the images are often faked. This morning I’ll show you how to easily spot a faked before and after “stem cell” therapy X-ray. So is this true? Are these clinics really able to take a bone-on-bone knee and make cartilage grow in the joint space? After all, the before X-ray shows no space in the knee joint before stem cell therapy, while the after X-ray shows a healthy amount of space after, suggesting a nice cushion of cartilage has grown there. The answer is a big no! No clinic, chiropractic or otherwise, can grow large amounts of new cartilage in a severely arthritic knee, as if by magic, in a bone-on-bone joint. And the X-rays? They’re a scam. I’ll explain briefly below, but for more detail, and to view my demonstrations on actual knee X-ray before and after images, watch my video above. There are two common ways this farce happens: direct measurement errors and changing the angle of the X-ray beam. I’ve already blogged on cases of the first one, where the chiropractor merely doesn’t measure the knee or hip joint space width accurately. The second type of error involves how the X-ray is taken, and this is the one we’ll focus on today. These scammer ads claim the evidence is in the joint space and provide before and after knee arthritis X-rays to support their claims. First, there’s what you don’t see before the stem cell therapy: no space in the knee joint. The X-ray appears to show bone-on-bone arthritis with no space in the joint, meaning there’s no cartilage there. Next, there’s what you do see after the stem cell therapy: a nice wide space in the knee joint. The X-ray, this time, suggests that cartilage (which can’t be seen on X-rays) has seemingly grown in the space following stem cell therapy. So if this is fake, what gives? Are they showing us knees from two different people and claiming it’s the same knee. No, it’s the same knee; the illusion, however, is in the way they are performing the X-ray. While most people will focus exactly where the ads tell them to focus on the knee X-ray image—the joint space—the illusion can be revealed by focusing on another area of the X-ray in the images in the video above: the kneecap. The kneecap shadow in the after images actually goes up, and in the video, I highlight this difference with lines and measurements showing the kneecap differences between the before and after images. So why is this important? What does the kneecap have to do with the joint space and how does it reveal a scam? The change in the kneecap shadow shows that the X-ray beam between the before and after images has been repositioned. In the before images in the video, you will see how the X-ray beam goes through the knee joint obliquely, or at an angle rather than straight through, which makes the joint space appear smaller and thinner than actual (i.e., little to no joint space), which means the patient appears to have severe or bone-on-bone arthritis. In the after images demonstrated in the video, the X-ray beam now goes directly through the knee joint. In other words, it’s seeing the knee joint head on, or straight through, and now the joint appears to be wide open, or at maximum width (how it actually appears if correctly x-rayed). Nothing at all has changed in the knee joint; only the X-ray beam is repositioned. And the before and after knee X-ray illusion is passed on to the unknowing public by chiropractic clinic scammers seeking to sell bogus stem cell therapies. Look for the position of the kneecap. If the kneecap goes up in the “after” image, then the joint measurement is a scam. 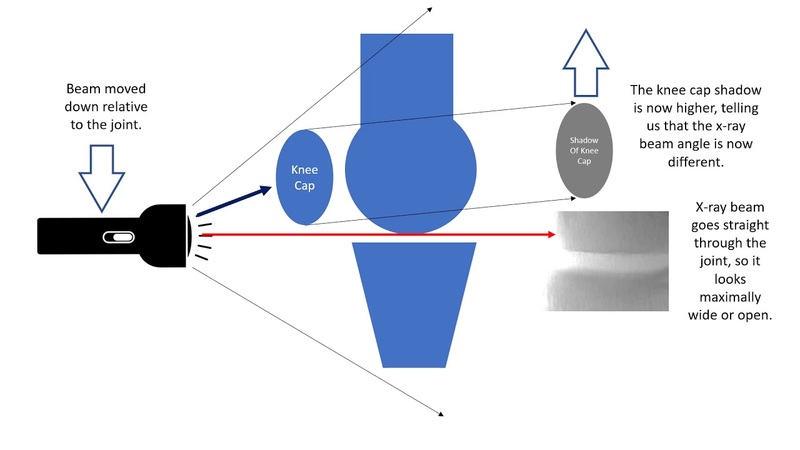 If the kneecap doesn’t move, then check the accuracy of the measurements by blowing up the image (as discussed at my link above). Ask a common sense question: where are the MRIs showing regrowth of cartilage? There are thousands of MRI scanners in the United States, why was one not used here? The upshot? These scammy X-rays seem to be a key part of the chiro “stem cell” sales pitch. Yet I have yet to see a single one that actually shows any evidence of cartilage regrowth; they are all either bad measurements or a different beam angle. Why? Because even a real stem cell therapy won’t regrow you a new knee if you have “bone on bone” arthritis, let alone the dead amniotic or umbilical cord tissue they use in many of these chiro clinics. I had a stem cell therapy on both knees almost 2 yrs. ago on March , 2019 . The clinic touted that they use live stem cells . My X- ray initially came out as bone to bone . another series of PT’s in which my primary doctor just approved 2 sessions instead of the 25 that they suggested . I went to the 2 sessions & that’s it for me . since I already had 25 sessions prior to the stem cell injections of one time each knee . My improvement overall is from 5 to 7 or from 6 to 7 . However I still have pain on both knees . My primary doctor injects me with steroids occasionally since it is not good for the bones . I was injected also the comb of the rooster gel once a week for 5 weeks . It seems it doesn’t work that well . Afterwards I was injected again the steroids , of course , after several months , then another round of rooster comb this previous January , 2019 , 3 X in 3 wks. My question is , do I have a legal course of action VS the chiropractor / stem cell practice , knowing what I know now about the stem cell practice ?